This Friday 22nd, sees a new photo exhibition opening at 'Olympia two' in London. It has been four months since the Tsunami devastated towns in the Sendai area and one photographer, Christina Aiton, an Australian living in Shichigahama, has documented 14 families from the area and their lives in the aftermath. 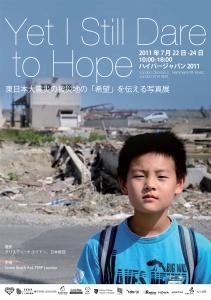 "Yet I Still Dare to Hope" uses photography, narratives from survivors and features items from the tsunami hit area to show the reality of what the residents of Shichigahama are living through. At the same time the exhibition focuses on hope, as the community begins to rebuild their lives and attempt to move on. The exhibition starts this Friday July 22nd and runs until the 24th. Visitors will be encouraged to leave messages of support for the families directly affected which will be passed onto them. There is also the opportunity to donate money or buy things at the shop with the proceeds going to Shichigahama residents. More information, including a map of how to get there, can be found at this site.